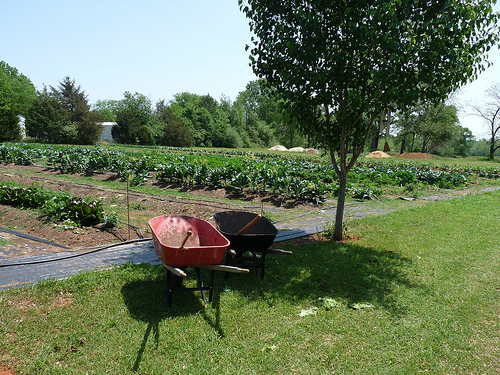 Long time readers will recall the local CSA farm we joined nearly three years ago. 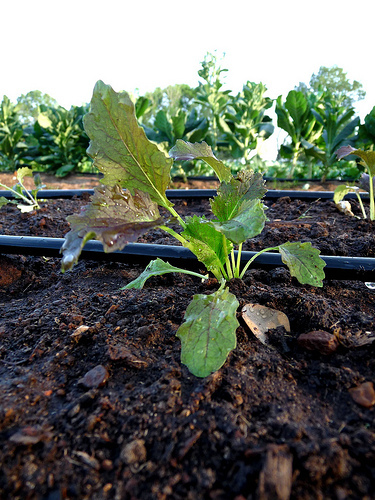 (Don't know what a CSA farm is or why they're an excellent idea? The previous link will explain everything!) We were members of this CSA for about two years, at which time we quit for a variety of reasons. We loved the idea of the CSA and the philosophy behind it - we just didn't feel that particular one was a good fit. While I still made an effort to shop at the farmer's market every Saturday, I missed the convenience and adventure of picking up a basket of in-season goodies and figuring out what to do with them. When I shop from individual vendors I tend to stick to things like onions, potatoes, squash, peppers - items that are delicious yet familiar. When I am a member of the CSA, I'm up to my ears in things like beets, chard, radishes, and Jerusalem artichokes. You see, I want to have a more adventurous palate. It's just easier when someone chooses my produce for me. Lucky for me and my palate, another local CSA came on to the scene last year and this season we became official members. We've received two baskets so far and volunteered at the farm once (you get a discount for volunteering, and I love discounts). I know it's only been two weeks, but so far I love this farm and the people who run it. 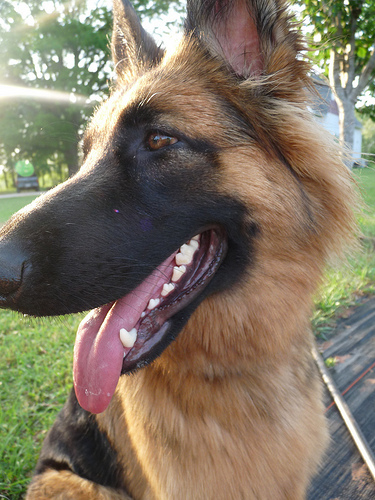 Elka, a one year old German Shepard that naps in the raised beds. I wanted to steal her. 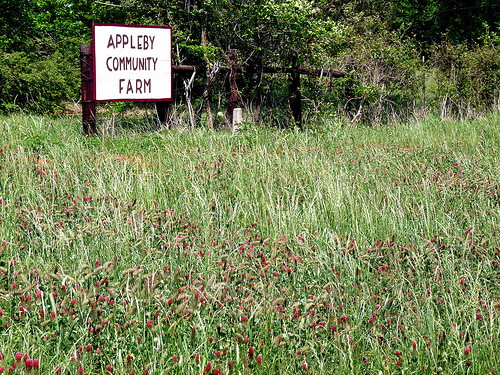 Appleby Community Farm is only about a five minute drive from our house and we pick up our basket there each Friday afternoon. I like seeing the farm every week - it makes me feel close to my food, plus the gardens are so beautiful and lush. Right now there are about 50 members, and our shares are grown on about four acres of land. That didn't seem like enough farm to me, but it seems to work. Because it's early in the season our baskets have been mostly greens so far, but that's fine with me. I'm actually one of those annoying vegetarians that LOVES salad, so I've been making all kinds of green concoctions with anything I can find in my crisper. Delicious! 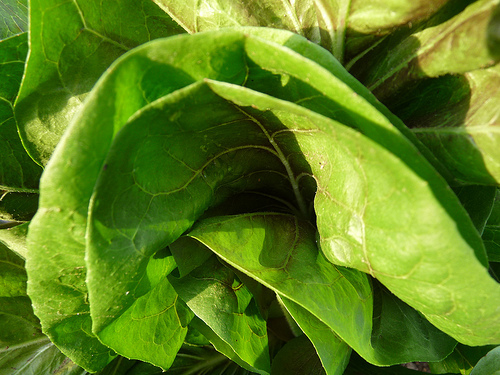 Getting my greens is easy with the CSA. On Sunday night, Nathan and I headed to the farm to put in a few hours of volunteer time. 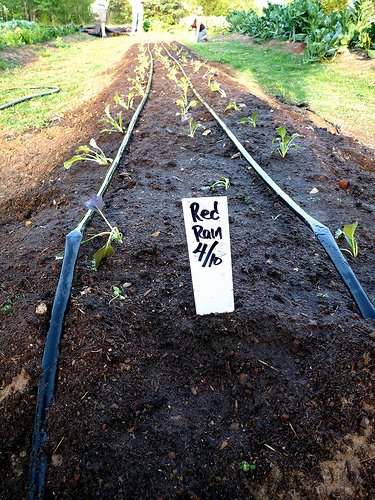 I planted a full bed of Red Rain, an Asian green, and lettuce. Then Farmer Cindy and I weeded the carrot beds until it got too dark to tell what was a weed and what was a carrot. We brought a few beers with us and it was a wonderful and fulfilling way to spend an evening. Which is great because Nathan's life plan involves buying land, becoming excellent farmers and then starting up our own CSA. Obviously this is many years down the road, but it's a nice dream and one of which I fully approve. I love food, I love being outdoors and I love being a force of good in any way I can. A small business that puts fresh, local, organic food on the table of my community fulfills all those loves and is definitely a goal worth working towards. I will eat you later.